Three years ago, the world cheered when parliamentarians drafted, and voters approved, provisions in the country's new constitution to guarantee women equal access to and control over land. The move was based on the understanding that about half of the agricultural labor in Africa, and Kenya in particular, is done by women. In this context, support for women's rights to the land they farm is part of a larger strategy to economically empower some of the most disadvantaged women in the world -- Africa's rural women. women's access to land and property is central to women's economic empowerment, as land can serve as a base for food production and income generation... Agricultural production and food security also increase when women are granted tenure security. 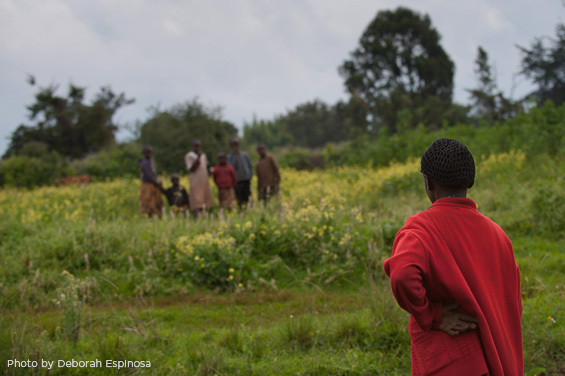 Women having secure rights to land is not just good for women, their families and communities -- it is good for Kenya. But then on November 12, a majority of the country's parliamentarians - over the objections of many of Kenya's female lawmakers -- voted to amend the country's matrimonial property bill, which has been in development since 1997. The bill, which is intended to define the rights of spouses in relation to matrimonial property, previously contained progressive provisions that echoed the constitution's protections of women's land rights. Last week's amendments gutted these provisions. The revised bill is now awaiting President Uhuru Kenyatta's signature. It does not, however, comply with fundamental protections of spousal land rights as established in the 2010 Constitution and 2009 national land policy. The bill is unconstitutional and, if passed, would signify a tremendous setback for women's land rights. Part of the problem is that it defines matrimonial property as only property that is jointly owned by the spouses. Given the predominant customs in Kenya -- in which men inherit property and women move in with their husband and therefore do not own land -- very little, if any, property will be considered matrimonial in nature under this narrow definition. If signed into law, this bill will allow women to be stripped of any family property, including the home in which they live, upon divorce or the death of their husband. Even though married women contribute to the wellbeing of the family, caring for the home and for children, their labour will not count in the division of property. This is at odds with the constitutional mandates that laws protect the property interests of dependents, including spouses, and include the right to occupy as an interest to be protected. At the same time, the bill also provides that any household debts are evenly shared between husband and wife upon dissolution of the marriage. This is a step backward for Kenya. The matrimonial property law offers an opportunity to make real the promises made in the country's new constitution. To ignore those promises not only contradicts the rule of law, by failing to adhere to the constitution, but also denies Kenyans the benefits that equal property rights for women can provide. Research shows several benefits across development areas -- including gender equality and women's empowerment, nutrition and food security, reduction of disease and violence, and environmental sustainability -- when women have secure rights to land and related assets and resources. We know from research and experience that it matters who within a household has rights to and control over land -- women and men must have equal rights. While male farmers often focus on cash crops, women concentrate on growing crops that provide their family with good nutrition. There is an increasing body of research that confirms the ripple effect of women's land rights. A study in Nepal found that children are less likely to be underweight if their mothers own land. Another, in Nicaragua and Honduras, presented at the World Bank, found that families spend more on food when the woman of the house owns land. And a study in Ghana found that families allocate a larger proportion of their budget to food when the woman owns a larger share of farmland. At the passing of the new constitution, Kenya -- where 35 percent of children are stunted from poor nutrition -- appeared poised to begin reaping such benefits. The Federation of Women Lawyers in Kenya is appealing to Kenyatta to reject the bill. They have announced that if Kenyatta does not heed their call, they will challenge the bill in court. Now is the time for Kenya and Kenyans to live up to the words expressed by the president in a speech to parliament this year: "We will champion the rights of all Kenyans, preserving and defending them not only through good governance and respect for the rule of law but also by extending the right to social protection." If these words are to have any meaning for Kenyan women, the bill should be revised to conform with the promises guaranteed to them under the constitution. This post originally appeared on the The Guardian's Poverty Matters Blog. For more information on the importance of equal rights for women and men in Kenya, watch this video on our Justice Project, "Elders Speak: A New Dawn for Women in Kenya." Renee Giovarelli is the senior attorney and advisor for the Landesa Center for Women's Land Rights. Tim Hanstad is the president and CEO of Landesa.